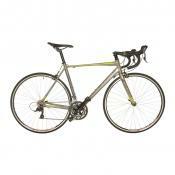 The frame of this bicycle is lightweight and durable owing to 6061 aluminum alloy it's made of. 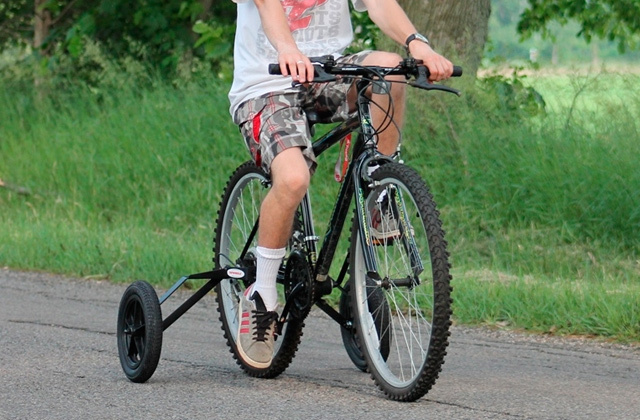 Wide tire treads allow easy riding through cross country terrain. The fork has no shock absorber. 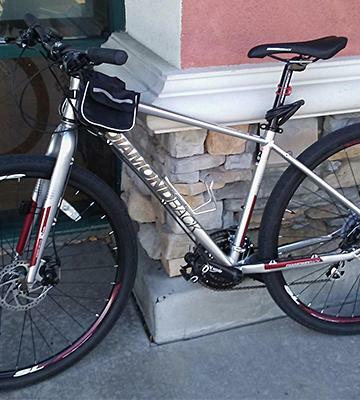 The Diamondback hybrid bike is a robust vehicle for enjoyable trips on surfaced and cross-country roads. The high-quality components of this model will serve long, and the bike comes in different sizes to meet any user's requirements. It is possible to attach a special child seat to the reinforced rear rack of the Schwinn hybrid bicycle. Some users complain about a difficult assembly process. 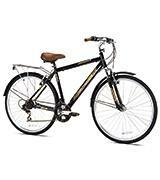 Give your other half this hybrid bike by Schwinn as a present and you won't go wrong. Due to a low crossbar, she'll never have a problem getting on the bike. 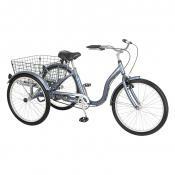 The supply kit includes fenders, a rear rack, and a basket! 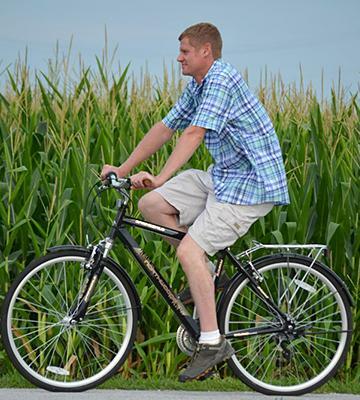 Riding this hybrid bike is convenient thanks to a large and soft seat. The wide handlebar provides a firm grip and consequently a full control over the bike. 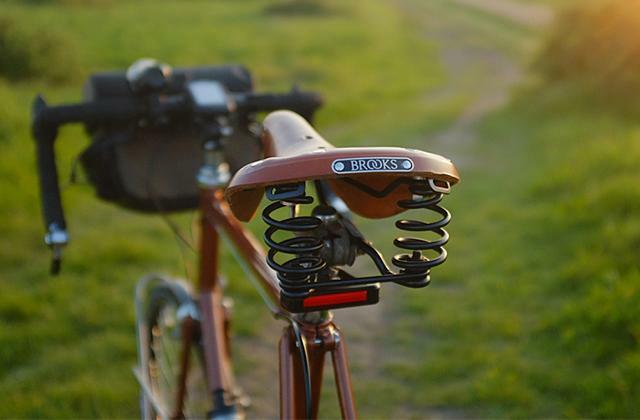 The seat post has no shock-absorption. 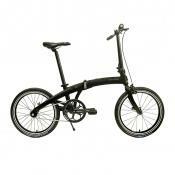 Owing to a frame design for upright riding position this hybrid bike is suitable for men and women alike. It won't take you long to put it together nor will it be a problem to carry it around when necessary. 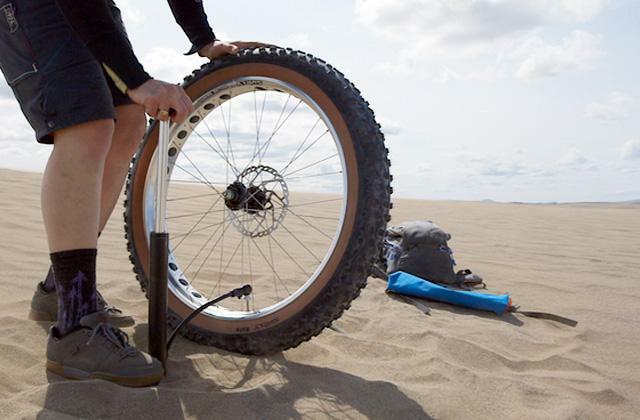 The quick-release front wheel allows you to quickly replace a tire or spokes. A gear cable of the front derailleur is too close to the rear wheel. 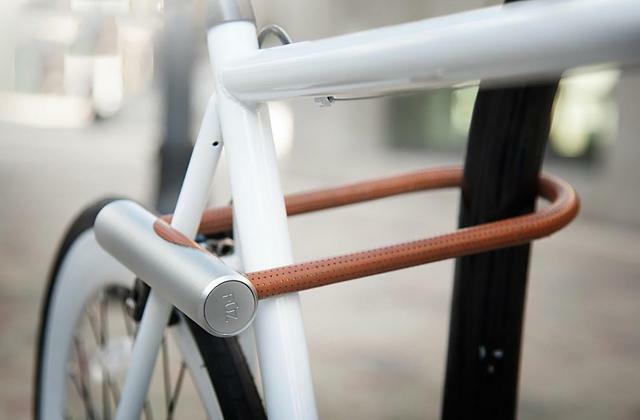 Combining the features of city and road bicycles, this hybrid bike will be great for riding to work, to a park or just around your neighborhood. 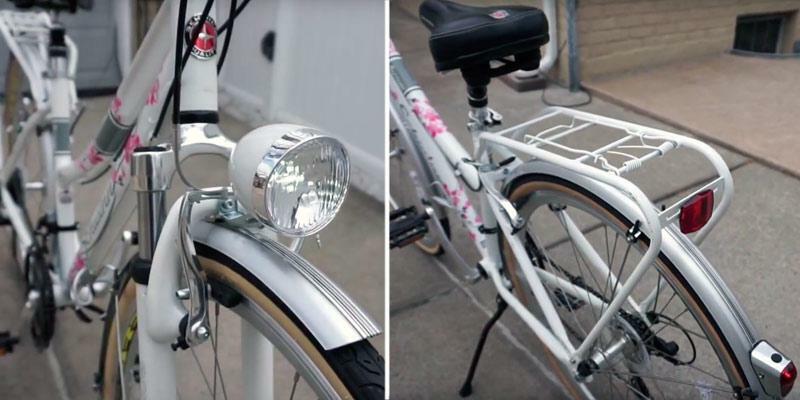 The reflectors on the rack and handlebar will make you visible at nighttime, thus, minimizing the risk of an accident. The rear rack is rather fragile. 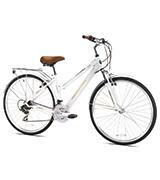 This hybrid bike is an amazing choice for passionate cyclists who like riding in a city and in a countryside. The tires of this model are wide enough to ride smoothly on earth roads. 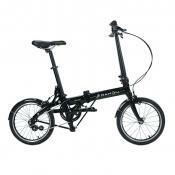 It's a great city bike by Diamondback. Its frame is made of 6061 aluminum alloy, one of the most frequently used materials in the production of frames that combines lightness and strength. 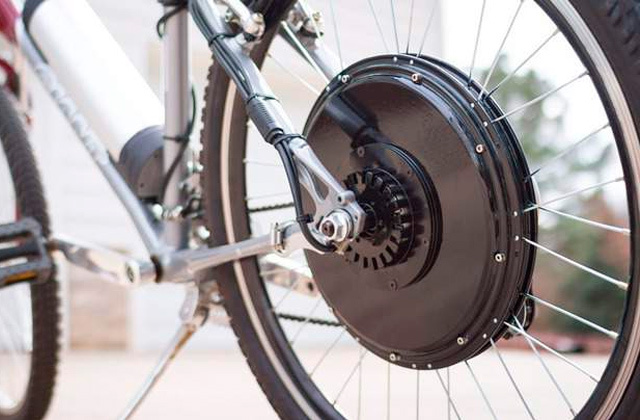 The bike is equipped with reliable Tektro disc brakes that won't fail and ensure your safety during a ride. The double-wall rims, 32 spokes, along with the Kenda Bitumen 700x45 tires stand for reliable performance of the bike's wheels on all types of surfaces. The high-quality Shimano TX51 dual pull and rear Shimano Altus derailleurs ensure a smooth switching between the available 21 speeds even in harsh conditions. 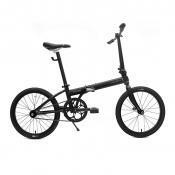 The front fork is not suspended, yet it's made of high-quality alloy that will let you ride confidently. 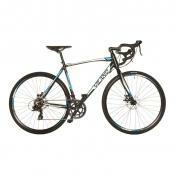 Diamondback Bicycles offers this model in the following frame sizes: 16", 18", 20", 22". 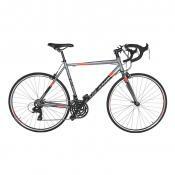 Thus, everyone can easily find the fitting hybrid bike from this company. 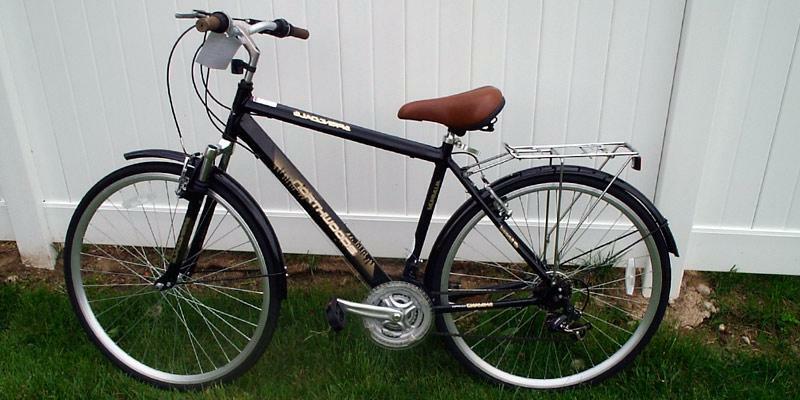 The Diamondback bicycle is a wonderful choice for people who wish to have enjoyable long-time rides. Also, we recommend you to read our review of electric bikes for even more comfortable and effortless cycling. 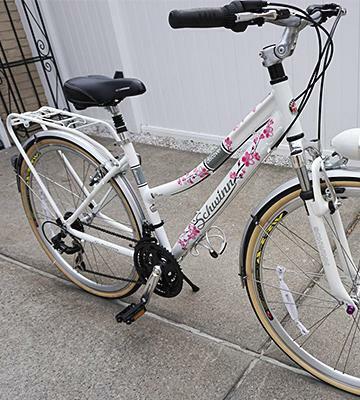 If you are looking for a bright present for your beloved one, we recommend paying attention to this Schwinn hybrid bike. 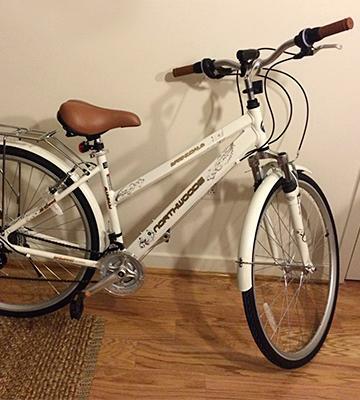 This is classical women's model classified as a road hybrid bicycle. This type of vehicle should be preferably used on flat concreted or asphalted roadways but can also be suitable for mud roads. You'll be pleased with this bike's performance which is provided by its elaborately picked components. The rigid aluminum frame ensures a long lifespan. Pay attention to the SR Suntour M3010 suspension fork which is typical for mountain and urban bikes. Having a 63mm travel, this fork will smoothen road highs and lows. We should also highlight the Shimano Tourney derailleur that boasts a great quality and ease of speed changing. After all, mudguards on both wheels, a rear rack, and a basket (attachable to a handlebar) for shoppings make this hybrid bike stand out from other models. 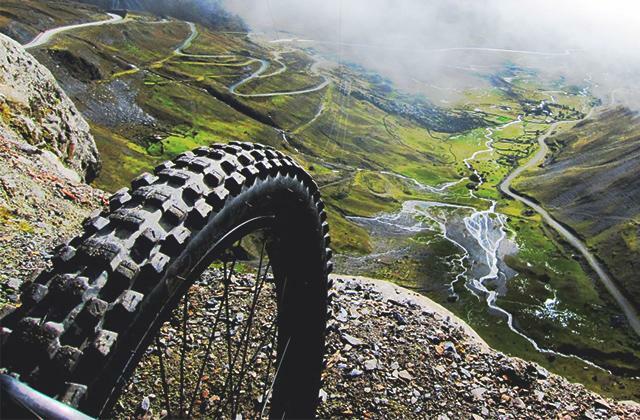 As a frequent cycling on asphalted roads leads to a quick tire wear, we advise buying road bike tires for your two-wheeled vehicle. 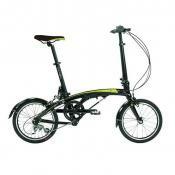 This hybrid bike is a wonderful pick for those who cycle not only around a town but also off-road. The large 27" wheels perfectly keep the pace and the medium tire treads don't slow down the speed. The front fork shock absorber dampers all bounces on your way. 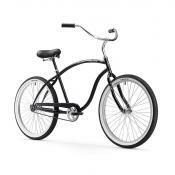 As for design, this Northwoods model resembles a traditional women's bicycle, yet its use isn't limited and it will be same comfortable for men. The strong aluminum frame makes the bike rather lightweight and allows you to easily ride it even if you are wearing lots of clothes. No matter where you go, to work or just on a weekend ride, the bicycle won't cause stress to your back and hands. The simple but dependable Shimano derailleur will let you ride uphill without getting tired too much whereas the brakes will stop the bike instantly while going downhill. What is more, a comfortable seat will deliver convenience throughout a ride. 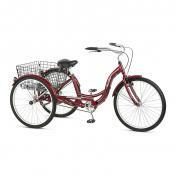 Finally, the model has wheel fenders and a rear rack for carrying personal items or attaching a basket. Well, the Northwoods Springdale hybrid bike is a versatile model combining an affordable price and high-quality components, so it is suitable for any cyclist. If you adore speedy rides, we recommend taking a look at road bikes. 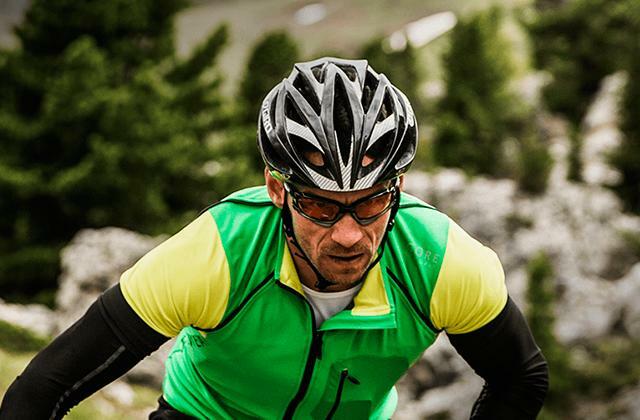 Hybrid bikes are outstanding for riders who conquer ever-changing road surfaces. So, Schwinn engineers did their best to embody the features of city and road bikes in this model. 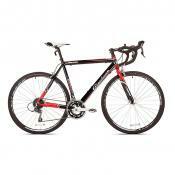 During cycling tours on a cross-country terrain, you will be amazed at how convenient this hybrid bike is. 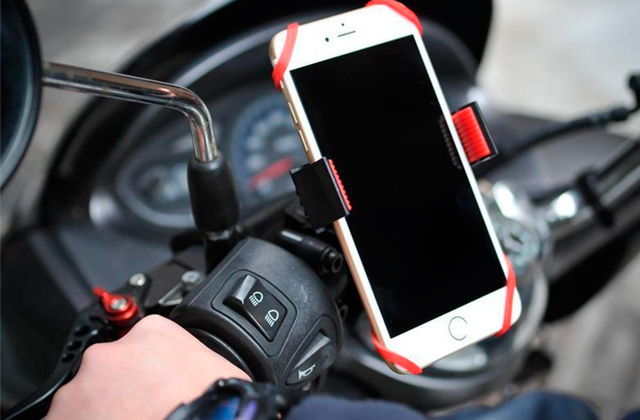 The model has a cushion seat the post of which has shock-absorbing capabilities, so you don't feel discomfort even while riding over pits and bumps. A front fork with suspension will make cycling utterly convenient. 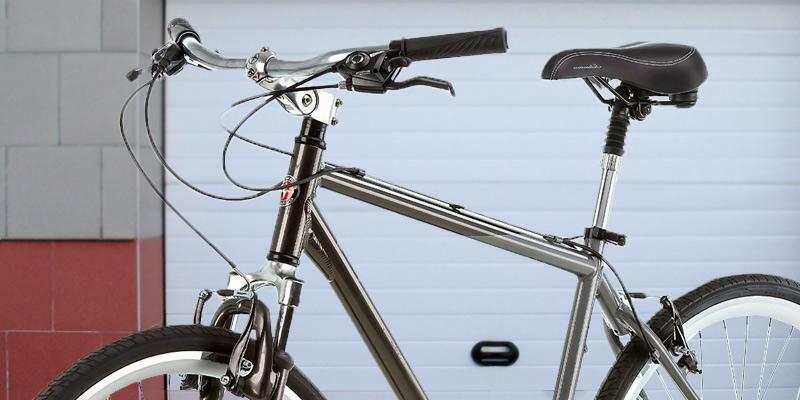 A handlebar is fitted with ergonomic grips and Shimano gear levers. A lightweight aluminum frame, 26" rims, and 700с tires will let you cycle fast while the seat and a handlebar will provide a no-fatigue posture of your body with no stress on your waist and palms. No racks, splashers or baskets are included in the package which means there won't be any unwanted load. 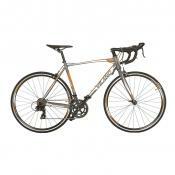 Having bought this bike, you'll get a lightweight and dependable two-wheeled vehicle which will be a good fit for a cycle racing. Consider buying a bike trainer for efficient indoor workouts. The Northwoods Springdale bicycle is just the right choice for users seeking for a happy medium between a city, road, and mountain bike. 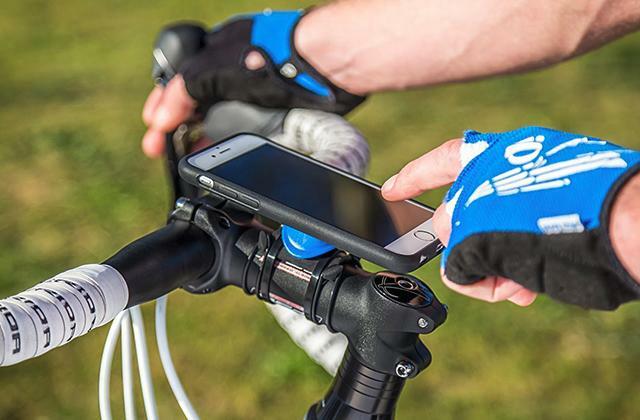 This model will be appropriate for both road and off-road cycling. Pretty big wheels perfectly run over flat roads and on undulating paths. 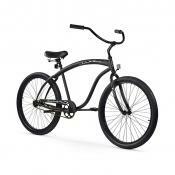 Riding this bike, you'll be able to gather an impressive speed and maintain it with a smaller effort. The wide tread of tires provides a great grip on any surface. 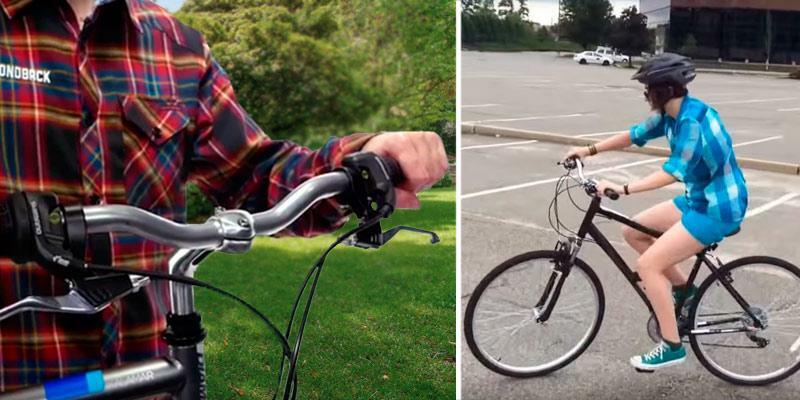 Unlike women's models, this hybrid bike allows keeping an upright posture while cycling. Therefore, you'll be riding longer without any pain in your back. 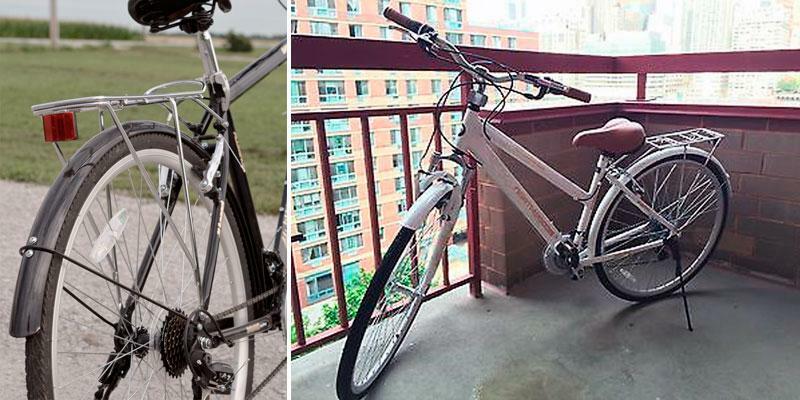 Commonly, hybrid bikes are equipped neither with racks nor fenders, yet this one is different. 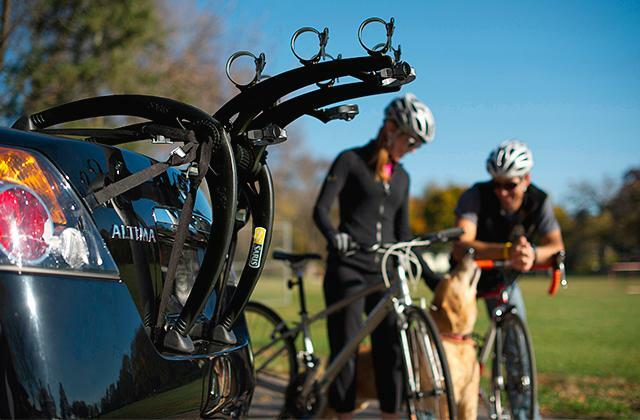 The rear rack allows carrying medium weights and the splash guards will protect you from water and mud. 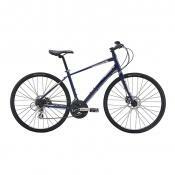 So, this bike is a favorable choice for those who need a bike for daily wheeling to work as well as for weekend touring. The 21-speed Shimano gear will come in handy when riding on a hilly terrain. 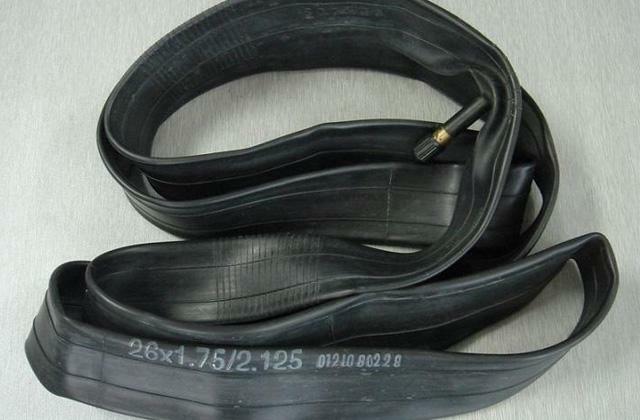 Pick one of bike pumps to keep the tires of your bicycle inflated and ready to go! 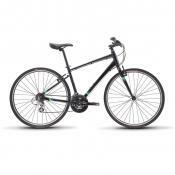 If you dream of a bicycle but can't decide where to ride, this review is for you. 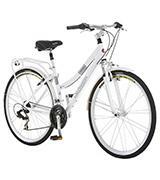 It covers hybrid bicycles designed for both smooth roads and broken terrain. Hence, hybrid bikes are successfully used for touring. 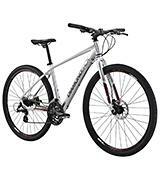 A hybrid bicycle is fit for a day-to-day riding and easily copes with mud roads so it is suitable for camping activities. 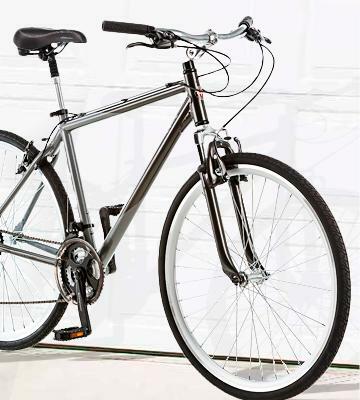 There are models of hybrid bikes for men and women (with high and low crossbars, respectively) and may have large and medium-sized wheels and supplementary accessories. We recommend reading our review of bike helmets to make cycling safe, as well as bike computers to monitor the distance, speed, and time of your ride. 1. 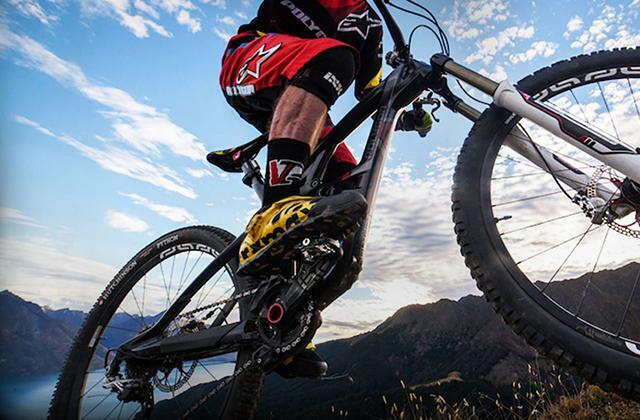 Hybrid Bikes: How to Choose, REI. 2. Euan McKenzie How To Pick the Best Hybrid Bicycle for Both Men and Women, Icebike. 3. 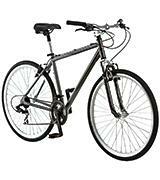 Hybrid bicycle, Wikipedia. November 1, 2016. 4. Oli Woodman What is a hybrid bike? BikeRadar. August 13, 2014.